What makes your life (or anyone's, for that matter ) meaningful? You could ask ten people what makes their lives meaningful, and get 10 different answers, but I think that you would find a common theme in their answers. In 2013 a study was published in the Journal of Positive Psychology that examined whether people thought their lives were meaningful, or happy. Jennifer Aaker, of Stanford Graduate School of Business, and her colleagues surveyed 397 people over a month, and one of their findings that I found to be most interesting is that happiness is linked to being a "Taker", while meaningfulness is linked to being a "Giver". I have always thought my life was more meaningful when I volunteered my time for a non-profit agency. In the early 1990's I assisted with event coordination and client support for what was then called The AIDS Committee of London, which provided services and support for people living with HIV and AIDS. It was certainly not one of the happier times in my life - a close friend had recently been diagnosed with HIV, which was pretty much a death sentence in those days; my employment situation and my marriage were both on shaky ground, and almost all the clients whom I spent time with, died. But at the same time, I felt like what I was doing really mattered, and that as crazy as my life seemed at that time, it had meaning. I had the same feeling when I volunteered with our local Crisis Hotline a couple of years ago. In most cases, the people I talked to on the phone during my time there were grateful to have someone to listen to them, even if I couldn't solve their problems. Unfortunately, after volunteering for a little over a year, some of the more stressful phone calls were starting to negatively affecting my emotional well-being, after much consideration, I made the difficult decision to give up my volunteer position. I started to wonder if there would always be a separation between happiness and meaningfulness in my life. The things I had chosen to do that added meaning to my life seemed to also be things that left me often feeling sad, or emotionally drained. Surely everything that made one's life meaningful didn't have to also be so stressful? With this in mind, I've decided to explore another volunteer opportunity, and have completed the training to be a Big Sister. I haven't been matched with a little sister yet, but I am feeling excited, and nervous about this new adventure, and my hope is that it will turn out to be both meaningful, and enjoyable. I won't be blogging about my experience, mainly for privacy reasons, but I did think my decision to try this was something worth sharing. Have any of you volunteered your time with a non-profit organization? Did you have a positive experience? 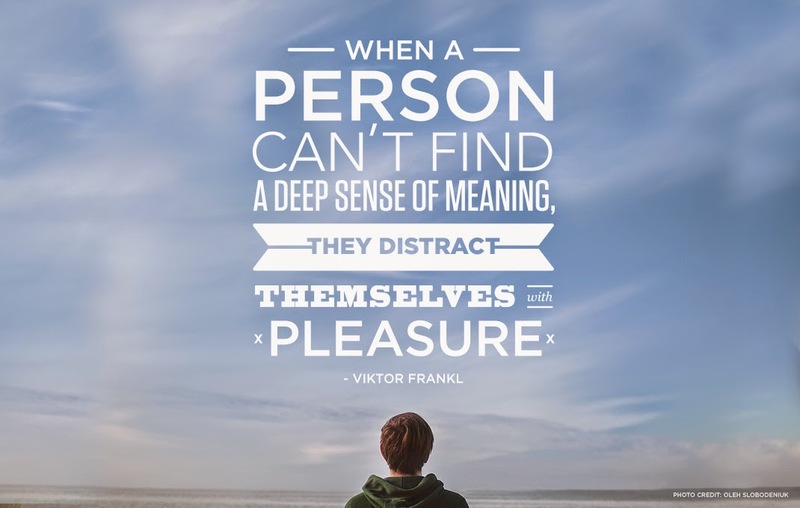 What brings meaning to your life? Shelley, I really enjoyed reading this and finding out a little more about you. I think your idea is wonderful, and I hope it works out really well for you and your Little Sister. I thought about doing that years ago, but I let my own anxiety get in the way. I've done other volunteer work in the past, but nothing that engages with other people quite so much. Guess I'm too insular that way. I say good for you for writing below the surface! Photos aren't everything, and content isn't nothing. I'm not disappointed at all. Set a good example! :) To try to answer some of your questions, I don't think there is a meaning to life, and I don't think there needs to be. On the other hand, maybe that really means goal? I'm all for goals, although in the current climate even the smallest can seem hard to achieve. I have looked into volunteering, and have found that most organizations don't want my labor - they want my money. I don't know where that money goes, and that doesn't make me feel useful. At best, I'm paying someone else to be useful if I donate money. I asked about volunteering to clean up the garbage-strewn tracks of my subway station (why not? they're always closing it down for repairs - why not close it down just one day for visual bearability?). I was told that would never happen because the unions would say it would take labor away from paid employees. But there's no funding for clean-ups, so why not just say yes to people willing to actually DO it, and for nothing? Big Sister sounds a wonderful cause to be involved in, I do hope they match you with a little sister soon. You're such a warm, witty, kind and generous woman and have so much to offer. Your work with the Crisis Hotline sounds like it was very challenging and stressful. Great post, Shelley. You will be a great Big Sister. If I start on life's meaning I'll be here all day. Thank you for making me think. Thanks for this post, Shelley. I too have become burned out by the nature of "giving" work, and had to take rests from it. I think your choice will be a fulfilling one and you'll be a fabulous Big Sister. And I have gotten much food for thought from Frankl's writings. He wrote about how to find meaning in the death camps, so I feel he can help me do the same, in my comfortable life. I am excited for you and your Lil' sis! I am sure it will do wonders for not only the child but for you as well. You have a unique perspective that is a value beyond measure. I have considered being one in the past, but I need to wait until my kids are a little older. I think it is a marvelous thing. So in the meantime, I help serve dinner at the Ark here in London once a month, and I know it is just a smidgen of a help, but it's something. A start. Your post is timely for me. I've been thinking about how I spend my time and energy, and am contemplating my choices. Activism seems a real possibility, as I watch the protests in the country from the sidelines. What really matters? How can I make a difference? I think you will make a great Big Sister. I applaud your thoughtfulness and your choice to create meaning in your life. Thank you for writing this post, Shelley. It's good stuff to consciously think about. It's the question of our age, I mean, second half of life age, don't you think? After all the seeking out and gathering of things during the first half of our lives. Being a Big Sister sounds good. Somehow I keep flashing back to a movie I watched last night (my true love's choice) called Live, Die, Repeat. Basically it was about this good time Charlie, used-car salesmen type of guy who gets the rug pulled out from under him with no way out. He wakes up to find himself in the army ready to ship out to war that day. He dies almost instantly. He wakes up to find himself in the army ready to ship out to war that day. This happens repeatedly. Each time he gets a little further, learns a little more, tries things a little differently. Sometimes worse things happen, sometimes different, always ending with him getting killed. And then he wakes up, again and again and again. He is changed, gradually into a different person from the good time Charlie anti-hero guy. He becomes clear, focused, aware, strong, of the moment, determined, etc., etc. This reminds me of what you're talking about somehow. I remember hearing about that film - an interesting concept! Unfortunately, we don't get to re-live our lives until we get it right, so a lot is trial and error. Oddly enough, I volunteered more of my time in my 20's and 30's than I have in the last decade. I don't know...there' something to it I think. Whether metaphorically, literally, emotionally, psychologically, or even spiritually, How one comes around to the same type of situations, feelings, states of mind, etc. And with consciousness and determination (or something else), one can choose different responses than previously all the while knowing no matter what the result, one can choose another different response the next time the same even/person/whatever appears. That's my deep thoughts for the day. A thought-provoking post, Shelley. Yes, what brings happiness and/or meaning into our lives will be different for us all. And it will probably fluctuate and shift for each of us over time too. I need structure in my life to feel good - I know this about myself. And since my opportunities for paid work have narrowed to virtual non-existence, I now create that structure and sense of usefulness (out of the home/family environment) through voluntary work. Helping out in the classroom at my kids' school, organising and running fund-raising events for the PTA, and now the charity shop work is great for me - I feel I am contributing to something other than my immediate family, and it fulfills my need for a role other than that of mum. I'm no Mother Theresa; I get as much as I give, and if the balance got out of kilter, I'd probably stop. I've only been following your delightful blog for a few months, but your post triggered me into my first comment! What I don’t understand is the false dichotomy between meaningful & happy. If it makes you happy, it can’t be meaningful? Meaning must be equated with suffering? Only martyrdom has value? It’s even built right into their biased question: happy OR meaningful life. That is not to say meaningful experiences cannot be difficult, even brutal. Of course they can. It’s just not mandatory. There is not just one type of meaningful experience. Transcendent joy makes me happy, & is pretty darn meaningful. To me, that is looking outside myself for someone else’s definition & validation of what I should find valuable, meaningful. It is passing off my responsibility to define what has meaning to me, & what brings me joy, to an outside agency with who knows what agenda. Your colourful hair makes me happy. It also has meaning to me to see someone who is not professionally beautiful (e.g. models & performers, paid to appear beautiful) & 18 years old enjoy flamboyant fashion & amazing hair. You look wonderful, and it brings me a lot of joy. AND inspires me to experiment more & follow my own appearance-joy! Thanks so much for your thoughtful comment. I am glad to know that how I choose to dress inspires other people to step out of their comfort zones, and being able to provide that inspiration is meaningful to me. I believe it is certainly possible for something to make you happy and be meaningful. I just found that with regard to my personal experience as a volunteer, which I felt added meaning to my life, as I was giving of myself to others, it did not necessarily make me happy. Of course, I chose to volunteer with organizations who were dealing with individuals in crisis! This is a good question. I am struggling for answers myself and have enjoyed reading everyone's responses, in particular the quote from the Dalai Lama shared by Quitelight. You will be an excellent Big Sister! Thank you for posting about what is on your mind- this is great food for thought. As a childless, spinster of sorts, I too am presently wresting with both meaning and happiness- and didn't think of the two as being separate- but your perspective makes so much sense. I'm going to mull this over a bit for myself. Thank you for stirring things up! Articulate post and great comments on it. I agree with Quitelight: If it makes you happy, it can't be meaningful? I call BS on that one. I'm a classic Giver/people pleaser, and it makes me feel good and fulfilled to know I'm helping other people - that's my job: I help people. I love it, but it's emotionally exhausting - I can't even imagine taking on a responsibility like being a Big Sister or volunteering on top of that! I have been thinking Deep Thoughts as I work my way through "Women in Clothes" - what my clothing means to me, the pleasure it gives to others, both from receiving my donations (charity shops, friends, coworkers) and in viewing me ("This makes me happy" - quote from a coworker). It's not goal-focused, but more of a journey - much like life. I don't want to constantly be striving towards Meaning like it's the be-all and end-all, but finding happiness in the little things every day? That I can achieve. It is so wonderful that you are able to open up and share what is in your heart. Not an easy thing to do. I am excited for you. New challenges are a way of challenging ourselves. I hope it brings the satisfaction you are looking for. I heard part of a great speech yesterday, which said if you are looking for meaning in life...don't. You won't find any. Which I believe is true. We each go through this life putting one foot in front of the other. Trying to move forward with purpose but knowing that in reality, we are all just tiny droplets in the vast ocean of life. I used to think that we'd understand it all once we got older. I realize that doesn't happen. Can one choose to be happy? Do one's choices make them happier? All questions that I don't think anyone can answer. I'm I doing anything with my life that's meaningful? I wonder about that sometimes. Then remember that I worked at a university for 21 years and even thought I was a part-time staff person, I held a lot of hands, was a shoulder to cry on and helped a large amount of kids get through school. I hate sounding like I'm blowing my own horn, but I think I made a big difference in the students who were in the practicum class I supervised. To this day, I'm friends with a great many of them and have enjoyed watching them grown up. A thought provoking post...throwing my own two cents in, I think that modern technology is creating vast voids in our lives. We miss real contact with real human beings, we lack patience to improve ourselves and our minds, we are unable to communicate with others face to face. We live in a society where many children are no longer being taught to write in cursive, to have an identifiable signature, to be able to express themselves without a peripheral interface. Human minds hunger for knowledge and when that is not given, nor truly encouraged, we try and fill it with pleasure, assigning meaning to drivel. What a fine thing it was for me to see this post, Shelly, on this particular day. I'm late to the party as always, but it's a gift you don't know you've given me to invite this conversation. This dark and internal time of year prompts these thoughts for me, too. Our little rural restaurant business is in an annual and expected (but never well received) DEEP slump period, and it's always a difficult time. Dan and I spend a lot of time questioning why we persevere in the service industry, as it feels especially thankless this time of year. We scrape our memories of nice things customers have expressed over the last year, and we try to remember the times when we've made folks happy, or extended ourselves for a higher purpose and it came out okay. Memory can be a lifesaver in times like these, but it can be exhausting just holding on to keep afloat. There are many worse things to do than feed people and make a place for nourishment and pleasure, but we've never made a complete success of the 20 years we've been doing it ... without allowing the idea of service to be enough when profits don't happen, that is. I'm impressed when anyone aspires to Frankl's level of enlightenment. I never quite manage to recognize that moment of freedom to choose my reaction in difficult times, but I sometimes remember after I react badly. (That might be progress, though!) "Man's Search for Meaning" still teaches me good things, even if I only succeed in living up to them an inch at a time! The idea of his that you present here is one that I find I fail at like so many of us. Pleasure has to so often salve the little wounds of my own failure. I'd hope that Frankl might give me credit for at least knowing my crutch. I've done non-profit work in the past, and it has it's rewards, but it can be exhausting when its all outgoing and not much comes back. We're not supposed to extend ourselves for the benefit of others and expect anything back, but if you can gain pleasure from it as well ... that would seem a fair return. I wish you and your future Little Sister much reciprocal pleasure and sustenance from each other. May she grow strong from your experience! Dan and I have very little family between the two of us, and none close or in frequent contact. There's just us, and with not much resource to celebrate the season, so we have to take pleasure in what meaning we can find. The fact that you are looking for pleasure in service to others should be a source of satisfaction all in itself, I hope. Good for you. And I have to cut myself some slack where Frankl's aspirations are concerned ... he's a tough act to try to emulate, and hope you'll do the same! Just enjoy! wonderful post and thoughful comments, there's a difficult question here and I haven't any answer! I've embraced more and more a 'carpe diem' attitude, which I know it can look frivolous, but it's meaningful for me. Not a huge fan of Meaning of Life as a concept, but I think there's no happiness if you feel your life is being wasted!!. So it's great to spread the world with whatever talent, love, art or knowledge you've got! and enjoy it!!. I really believe you will be a great Big Sister!! I'm volunteering at the Y but wondering these days if it makes me happy, if not, i will not do any good. So i'm thinking of quitting and be happy instead. Hope you are happy with being a big sister.